Vast-Decoders- Pinktronix Terrestrial & Satellite Television Installation Services. VAST Decoders on the market as at April 2014. Altech UEC had the market to themselves for the first two years after the introduction of VAST. There was only one model available and being 240 volt only, it required an inverter for operation from the 12 volt DC circuit in caravans. Several companies advertised 12 volt conversions of the original DSD 4121 ranging in sophistication, price and workmanship. Price, not technical impasse was a major disincentive to third party modification of the Altech decoder. The main problem regarding price was that once the modifying party opened the unit, they had to carry the full decoder 12 month warranty, whether unit failure was the modifier's fault or not. A Queensland company, Sat Plus, developed a sophisticated swap out module for the complete Altech power board, for the DSD4121, however immediate sales of the product were thwarted by Altech legal action. Sat Plus eventually won the legal case, but by then other models of 12/240 volt VAST decoders were released to the market, and although the after market power board was a well enginered solution, it was no longer necessary for the newer 12 volt decoder models. 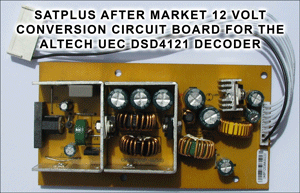 SatPlus still stocks the after market power boards as a 12 volt conversion for the olde DSD 4121. Considering the time which has passed since the release of this model, voiding the12 month decoder electronics warranty should no longer be a problem. Full installation instructions are included with each board. PinkTronix is not responsible for any inaccuracies contained in the following material. It is presented as a guide only. Buyers are encouraged to visit the websites of the relevant manufacturers and research the product directly from the manufacturer's data before making their purchase. Below is a table which explains some of the less obvious comparison parameters listed above. PVR Optional means that the device is PVR ready but you have to purchase the PVR remote and/or the PVR software upgrade separately. You will also need to purchase a storage device. Most specify a hard drive although some USB sticks seem to work okay. PVR Ready means that the device is PVR ready and all you have to purchase is the a storage device. Most specify a hard drive although some USB sticks seem to work okay. PVR means that the units are delivered ready to go as a PVR. Single. A single tuner machine allows the viewer access to only one live channel. You cannot record one live show and watch another live show simultaneously. You will be be able to record a live show and watch another live show provided there are no time conflicts. You may also be able to record a live show and simultaneously watch a recorded show. You should also be able to pause live TV, essentially time shifting your viewing segments of a live show. Dual. A dual tuner machine allows the viewer access to two live channels simultaneously. Simultaneously record one, watch another or 2 live channel recording and playback of a recorded file from hard drive is typical of these machines. A dual tuner decoder can do all a single tuner decoder can do. PVR Storage defines the storage device physical placement. 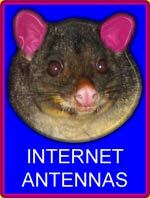 External via panel connections or internal via enclosed connections. (I.E.- Plug in or built in). Some models may accommodate both. 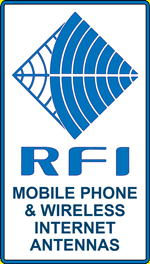 Analog TV Radio Frequency Signal Out is facility which allows the VAST digital TV received channel to be translated to an analog TV channel, which is then made available for distribution as an analog modulated RF signal via a standard PAL radio frequency antenna connection. The analog modulated radio frequency output of the decoder remains on the same channel regardless of which VAST digital channel has been selected, thus the slave TV can be left on the same channel but receive different programs as the channels are changed on the VAST digital decoder. Perhaps a handy feature for an older second TV in a household if the wiring is already in place, but it is an option rarely used these days in new installations because the channel selection is slaved to the one master VAST decoder. More in FAQ. It may be desirable, because of space or aesthetic constraints to site the satellite decoder in a place hidden from view, or not within the beam width of the infra red receptor for the decoder’s remote commander. An optional plug in remotel infra red target solves this problem by allowing the viewer to site the actual decoder in a convenient place, whilst maintaining infra red communication. Remember, if you chose this option you must still allow the decoder adequate ventilation. LEARN: Some remote controls have a learning section dedicated to basic host TV set commands. (On /Off, Volume, Channel Change, Input Select etc.) This allows the user to operate both decoder and TV with only the one remote control. ILLUMINATE: Some remote controls can illuminate some or all of the keys. This is an excellent feature for night viewing. 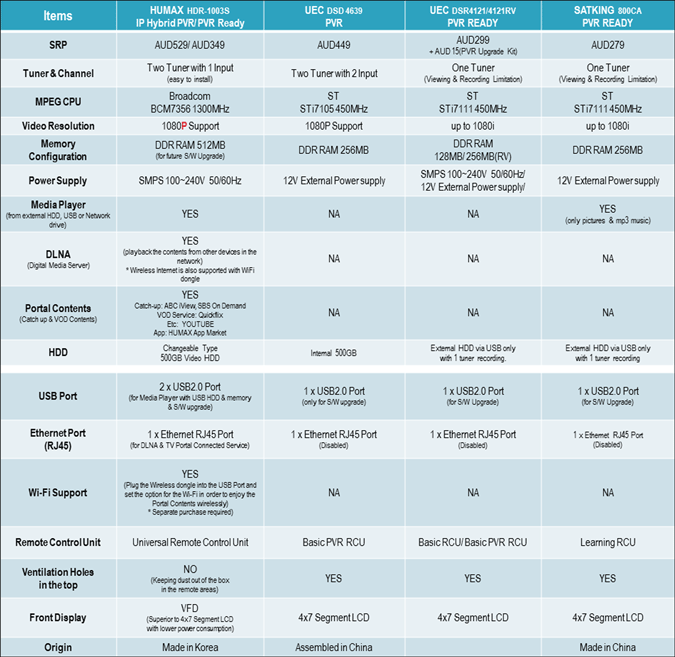 The Australian distributer for Humax, website http://nasaustralia.com.au/products/brands/humax/ has provided a visual comparison of decoders available and also a detailed feature comparison in the chart below the pic. A quick glance at the decoder rear panels will show that there is not too much between them in terms of input /output connections. The VAST service transmits in DVBS2 format and offers both high and low definition video and 5.1 sound when carried with the program. Thus, all the decoders have both the optical Toslink port and an RCA jack for the surround sound. All of them have a digital HDMI port for sound and video, all have the olde analog component video jacks, and all have the real olde analog CVBS composite video, (yellow video and stereo pair) RCA jacks. The simple olde analog CVBS port is a handy fault finding tool for when the HDMI digital link is suspect. The CVBS analog output will oftentimes work when there are issues with the HDMI link. All have a USB connecter for digital data transfer for upgrades or external memory. Video resolution becomes important with the larger household TV sets but is not a huge factor with the small caravan size televisions. Below is a picture of all the current VAST decoder remote controls...not to scale. 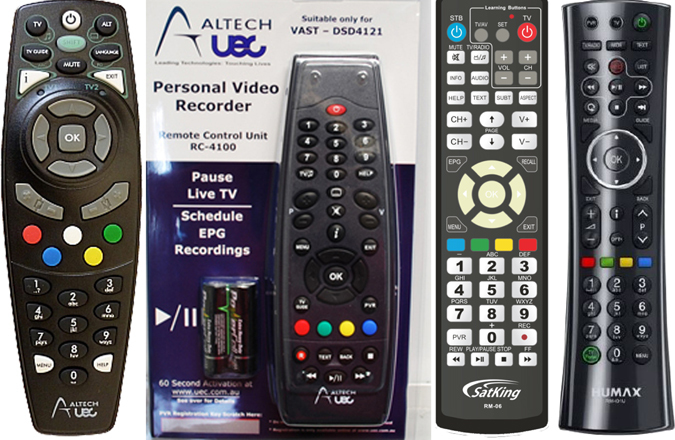 The Altech UEC PVR remote is shown in the optional PVR kit but this remote is the same for all Altech UEC PVR variants. The reader will note, possibly with some cynicism, that the manufacturers still can't seem to decide on an industry standard layout, although most functions on the remotes are similar, if not the same in some cases. The Very First VAST Decoder. 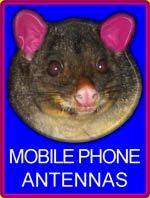 Call PinkTronix now for a great deal on the complete installation package!! Using only reinforced mounts and 90 centimetre dishes accurately aimed to maximise rain fade margin for the best possible service, rain, hale or shine.